Below grade wall waterproofing usually comes in handy with urethane injections or grouting when positive side waterproofing does not work due to surrounding circumstances. The foundation wall needs to be waterproofed on the interior side. Basement waterproofing, foundation waterproofing and suspended pool decks that may be leaking water usually need to be treated. 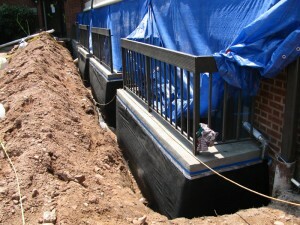 Retaining wall also may get treated with the urethane injection or epoxy injection.